HÀ NỘI — All eyes will be on Pleiku Stadium when hosts Hoàng Anh Gia Lai entertain Quảng Ninh in the fifth round of the V.League 1 tomorrow. Hoàng Anh Gia Lai are desperate for a win after three consecutive defeats. However, coach Dương Minh Ninh will have to do without midfielder Phạm Hoàng Lâm due to an ankle injury, influential South Korean Kim Bong-jin will also be on the bench due to a calf complaint, and while midfielder Nguyễn Tuấn Anh has returned from injury, he has yet to regain top form. 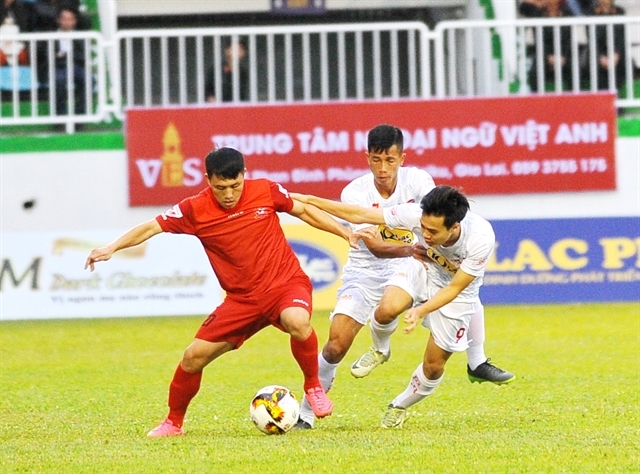 More than that, in a recent interview, Nguyễn Tấn Anh, an official of Hoàng Anh Gia Lai, said the team’s coaches were not up to snuff, leaving them ninth in the table with only one win. “We are committed to solving the problem but we need time. The V.League just runs for several rounds and there is a long way ahead. In football we need to have belief (in the coaching staff) and patience,” said Anh. “Hopfully in the next few weeks, the talented Vũ Văn Thanh will return after recovering for a long time for injury treatment in South Korea,” he said, adding that the national team defender was expected to play within four weeks. On the other side, Quảng Ninh, who are sitting sixth, are in good spirirts with seven points and no goals conceded in their last three league matches. However, the northern side have lost on their last three trips to Pleiku. The first two matches of this weekend are between defending champions Hà Nội FC and hosts Sanna Khánh Hoà, and Becamex Bình Dương and HCM City tonight. Hà Nội and Becamex are playing earlier than other teams as they need time to prepare for their AFC Cup matches next week. Hà Nội and Khánh Hoà’s last two meetings have ended drawn. HCM City have been something of a surprise package this season and sit undefeated after four games, their 10 points good for second in the table. Meanwhile Bình Dương, fourth in the table, are back on track after winning in both local and continental competition recently. In other matches, Viettel will welcome Nam Định in an all-V.League’s new comer game. Both teams are struggling in the lower part of the table, earning only one win each after four rounds.